Everyone who has spent at least a few minutes looking at a skateboard, will acknowledge the skateboard truck as one of the essential components of the skateboard. It’s what impacts how your skateboard maneuvers and rides, or simply put, how your skateboard works. Choosing the right skateboard truck and understanding the difference between the sizes, height, bushing style will not only improve your skating experience, but it will also help you become a better skater. 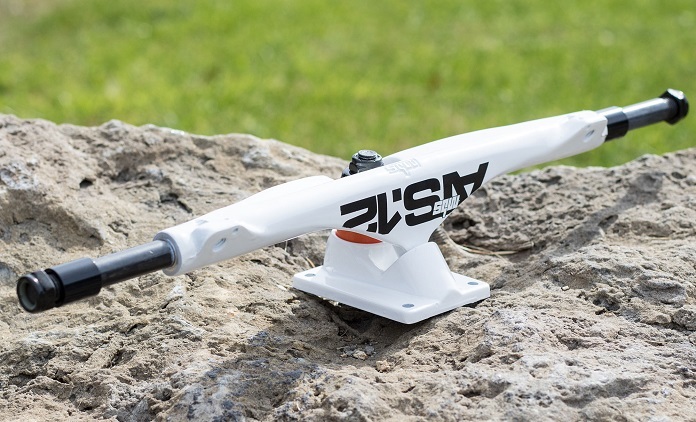 The truck size ideal for your skateboard is dependent on the size of your board, as well as the brand that produces the skate truck, as different brands use different axle lengths which are recommended for different deck sizes. 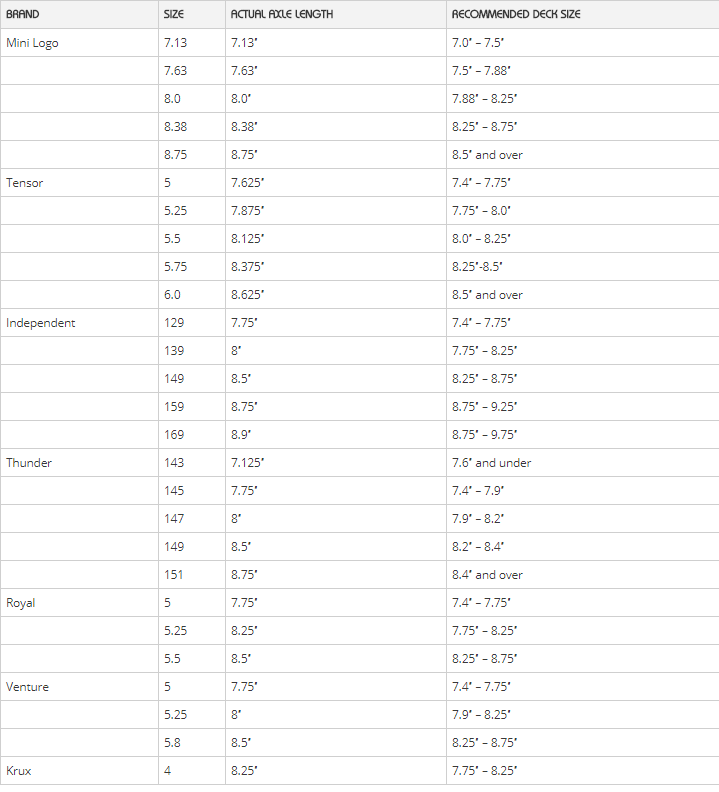 Here’s a chart with the recommended sizes of some popular brands. When measuring the skate truck width, it’s worth knowing that there are two parts that can be measured – the length of the axle and the length of the hanger. The hanger includes the surface area which is used to grind on, located on the inner part of the truck. Measuring the full length of the axle is done by measuring the distance between the two bolts located on the sides. Ideally, you want your skateboard to line up to the ends of the axle. As aforementioned, different truck brands use their own unique number system when they refer to the truck size, which makes it slightly confusing for buyers who aren’t familiarised with the sizing charts. You’ll generally see trucks referred to as “low” or “high” when it comes to their height. These terms refer to how much room there is between the hanger and the baseplate of the truck. Having a high truck means your board will be higher off the truck when compared to a low truck. There are also trucks that are considered “mid” or regular. Low trucks are great for flip tricks, technical street skating and can accommodate smaller wheels. Regular or mid trucks are ideal for mid sizes wheels (53-56mm) and skatepark and all around street skating. High trucks offer more clearance and can accommodate larger wheels (56mm+). The material and construction of the skate truck will heavily impact how it grinds, flips and rides. They’re most commonly made of one of the following 4 materials, or a combination from them: steel, titanium, magnesium and aluminium. For instance, the axles can be made of steel and the hangar can be made of aluminium. You’ll also find hollow vs solid versions of some materials. Hollow types are typically lighter than the solids, which can also influence the performance of the skateboard.